Circuits containing R, L, C elements often have special characteristics useful in many applications. Because their frequency characteristics (impedance, voltage, or current vs. frequency) may have a sharp maximum or minimum at certain frequencies these circuits are very important in the operation of television receivers, radio receivers, and transmitters. In this chapter we will present the different types, models and formulas of typical resonant circuits. A typical series resonant circuit is shown in the figure below. In many cases, R represents the loss resistance of the inductor, which in the case of air core coils simply means the resistance of the winding. The resistances associated with the capacitor are often negligible. The impedances of the capacitor and inductor are imaginary and have opposite sign. At the frequency w0 L= 1/w0C, the total imaginary part is zero and therefore the total impedance is R, having a minimum at the w0frequency. This frequency is called the series resonant frequency. The typical impedance characteristic of the circuit is shown in the figure below. This is the so-called Thomson formula. If R is small compared to the XL, XC reactance around the resonant frequency, the impedance changes sharply at the series resonant frequencyIn this case we say that the circuit has good selectivity. This means at the resonant frequency the voltages on the inductor and the capacitor are Q0 times greater than the total voltage of the resonant circuit. The typical run of the VL, VC voltages is shown in the figure below. Let's demonstrate this via a concrete example. Find the frequency of resonance (f0) and the resonant quality factor (Q0) in the series circuit below, if C=200nF, L=0.2H, R=200 ohms, and R=5 ohms. Draw the phasor diagram and the frequency response of the voltages. This is a quite low value for practical resonant circuits, which normally have quality factors over 100. We have used a low value to more easily demonstrate the operation on a phasor diagram. The ratio between VL, VC,and Vs is equal to the quality factor! Now let's see the phasor diagram by calling it from the AC Analysis menu of TINA. We used the Auto Label tool of the diagram window to annotate the picture. The phasor diagram nicely shows how the voltages of the capacitor and inductor cancel each other at the resonance frequency. Now let's see VLand VCversus frequency. Note that VL starts from zero voltage (because its reactance is zero at zero frequency) while VC starts from 1 V (because its reactance is infinite at zero frequency). Similarly VL tends to 1V and VCto 0V at high frequencies. This is a relatively high quality factor, close to the practical achievable values. Again the ratio between the voltages equals the quality factor! As we can see, the curve is very sharp and we needed to plot 10,000 points to get the maximum value accurately. Using a narrower bandwidth on the linear scale on the frequency axis, we get the more detailed curve below. Finally let's see the impedance characteristic of the circuit: for different quality factors. The figure below was created using TINA by replacing the voltage generator by an impedance meter. Also, set up a parameter stepping list for R = 5, 200, and 1000 ohms. To set up parameter stepping, select Control Object from the Analysis menu, move the cursor (which has changed into a resistor symbol) to the resistor on the schematic, and click with the left mouse button. To set a logarithmic scale on the Impedance axis, we have double-clicked on the vertical axis and set Scale to Logarithmic and the limits to 1 and 10k. The pure parallel resonant circuit is shown in the figure below. If we neglect the loss resistance of the inductor, R represents the leakage resistance of the capacitor. However, as we will see below the loss resistance of the inductor can be transformed into this resistor. The admittances (called susceptances) of the capacitor and inductor are imaginary and have opposite sign. At the frequency w0C= 1/w0Lthe total imaginary part is zero, so the total admittance is 1/R-its minimum value and the total impedance has its maximum value. This frequency is called the parallel resonant frequency. Note that the impedance changes very rapidly around the resonance frequency, even though we used a logarithmic impedance axis for better resolution. The same curve with a linear impedance axis is shown below. Note that viewed with this axis, the impedance appears to be changing even more rapidly near resonance. determined again by the Thomson formula. 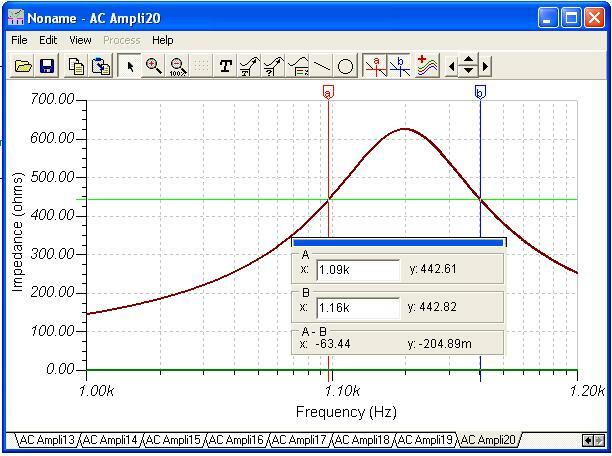 At this frequency the admittance Y = 1/R = G and is at its minimum (i.e., the impedance is maximum). The currents through the inductance and capacitance can be much higher then the current of the total circuit. If R is relatively large, the voltage and admittance changes sharply around the resonant frequency. In this case we say the circuit has good selectivity. Another important property of the parallel resonant circuit is its bandwidth. The bandwidth is the difference between the two cutoff frequencies, where the impedance drops from its maximum value to the maximum. This formula is also applicable for series resonant circuits. Let us demonstrate the theory through some examples. Find the resonant frequency and the resonant quality factor of a pure parallel resonance circuit where R = 5 kohm, L = 0.2 H, C = 200 nF. Incidentally, this quality factor is equal to IL /IR at the resonant frequency. The simplest way is to replace the current source by an impedance meter and run an AC Transfer analysis. The "pure" parallel circuit above was very easy to examine since all components were in parallel. This is especially important when the circuit is connected to other parts. However in this circuit, the series loss resistance of the coil was not considered. Now let's examine the following so called "real parallel resonant circuit," with the series loss resistance of the coil present and learn how we can transform it into a "pure" parallel circuit. We will also assume that the quality factor Qo = woL/ RL>>1. Compare the impedance diagrams of a real parallel and its equivalent pure parallel resonance circuit. Finally, if we use copy and paste to see both curves on one diagram, we get the following picture where the two curves coincide. Finally let's examine the bandwidth of this circuit. Lets confirm it graphically using the diagram. The difference of the A-B cursors is 63.44Hz, which is in very good agreement with the theoretical 63.8Hz result even taking the inaccuracy of the graphic procedure into consideration.